The Course I gave wit Unesco as part of the DigiArts project (Masters Module on Arts, Design and Technology) is finished and some very interesting project were delivered by the students. The fact that this was an online course and that participants were located in different cities in the Arab world made the research and visual data collected very interesting, and the end project very diverse. 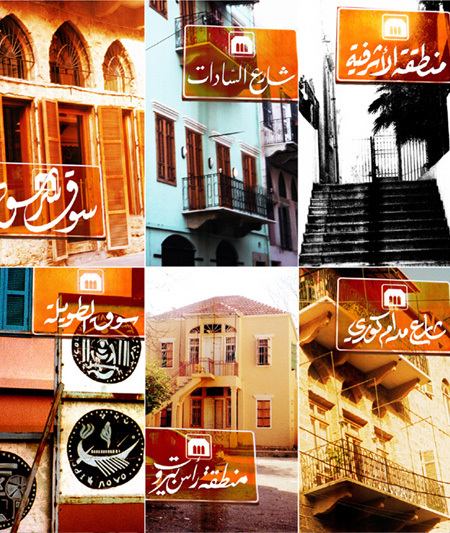 Above is an example of delivered projects- by Ghada Majed- who studied the use of Arabic Traditional Calligraphy for signage across the city of Beirut. The calligraphic style chosen for every neighborhood attempts to reflect the environment and character of the specific area. The final presentation of the project combined the calligraphic signs with photos of the areas with focus on their architectural character.